On January 20th, 2010 I posted a little piece about the old US Coast Guard Cutter Cartigan, which used to sit, when I was a kid back in the 1960's, in Sheepshead Bay, which is in Brooklyn where I grew up. It was a beautiful ship to me, and, as I wrote in that post, no small influence in my going to sea several years later. I got 3 comments on the piece, on the blog, but have also continued to receive e-mails from people who have had a connection with the ship in one way or another. 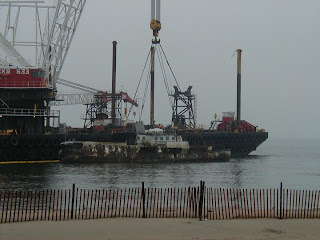 This comment was posted to the blog yesterday eveing and I thought I'd share the unusual story, as well as the link to the photos taken by Mr. Petersen, which show the ship being removed from the Bay. And Mr. Petersen is right, that old girl gave them one hell of a fight. Thanks for being there with your camera and sharing these photos with us. "Hi, A few years ago, I was employed by CUNY at Kingsborough Community College. I recall how one very foggy morning I heard the loud chugging and saw the large dark silhouette of some type of crane barge. Little did I know that this barge was charged with removing the Cartigan. I was so grateful to have my camera that day because the most peculiar thing happened. The Cartigan put up one hell of a fight. Hanging by the spread slings from this crane barge, the Cartigan was being taken against her will around the tip of the College to where the school's beach was located. I thought they were a little too close for comfort and wasn't too shocked when the next day a second crane barge showed up to help the get unstuck. Believe it or not, this barge got stuck as well. 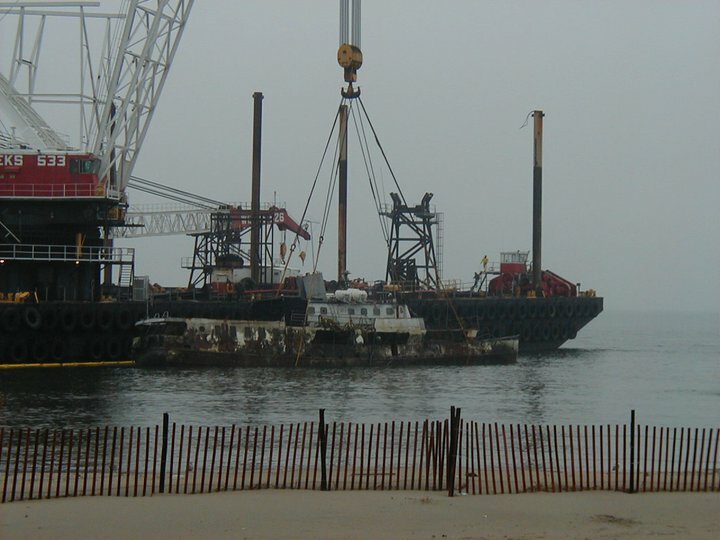 Eventually, a third barge showed up and was finally able to free the other two barges. Yup, the Cartigan sure put up a fight."